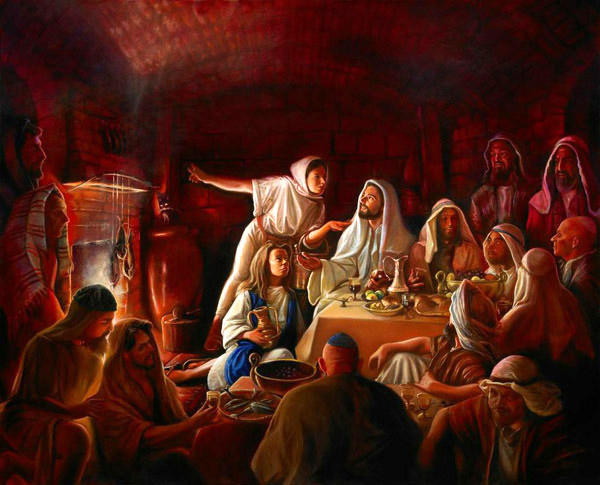 Some people say that all the great Christian paintings have been painted, and that there is nothing new to say. But as a Christian, I must add my voice. I, too, am a witness; I have a testimony to share. So do we all, if we profess a faith. I believe in Christ, and as I read and reread the stories of Jesus of Nazareth recorded in Christian scripture, something new always unfolds, even if it is new only to me and to my learning. I am interested most in painting those themes which have not previously been painted to my satisfaction, but there are also classic themes I wish to echo to add my voice. Much ado is often made about the historicity of Biblical paintings: did He really look like that? Did they have that kind of dinnerware? Shouldn’t their heads be covered? 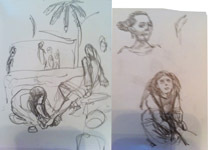 These are worthy questions, but they are of secondary importance. The story is the most important thing: the recognition, the lesson, the moral; the declaration of divine truth. 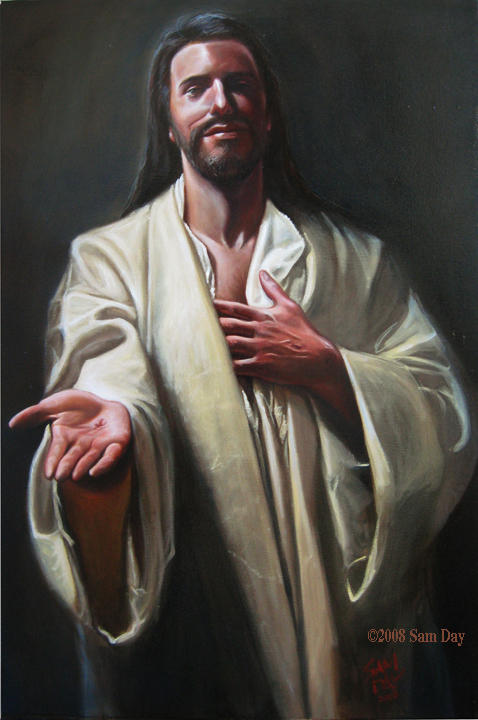 These paintings are my declaration of faith. by Sam Day, 2011-2014, oil on canvas, 72 x 88 inches. Jesus loves you, whether you're a Mary or a Martha. by Sam Day, 2008, oil on canvas, 60 x 48 inches inches. 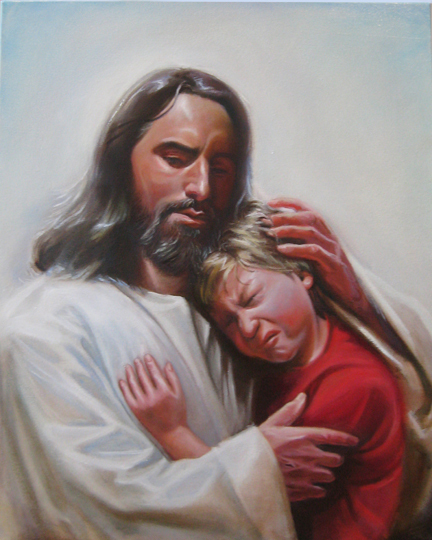 The angel was sent to comfort Him, but only He could bear the burden given Him by the Father. by Sam Day, 2010, oil on canvas, 64 x 84 inches. 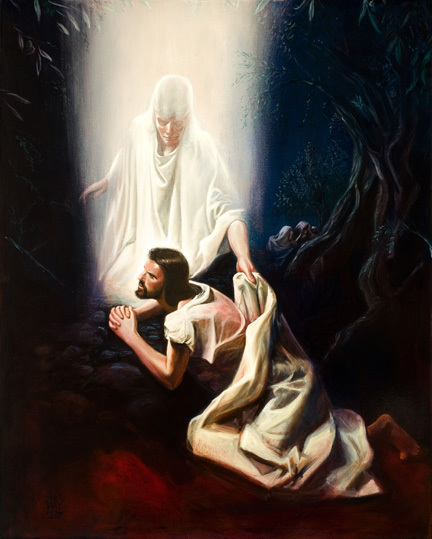 This painting is about the moment when each of us recognizes our Savior. by Sam Day, 2011, oil on canvas, 48 x 60 inches. Sometimes it takes the faith of a child to see the Truth right in front of us. by Sam Day, 2005, oil on canvas, 36 x 55 inches. 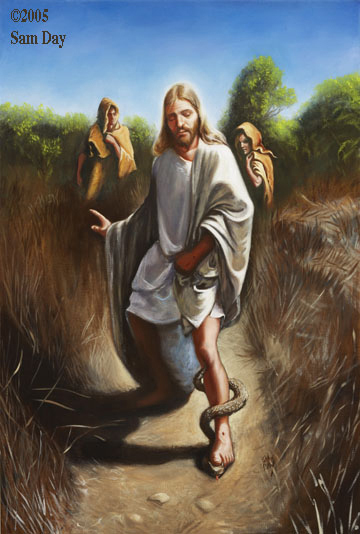 We all have a snake to put under foot. by Sam Day, 2008, oil on canvas, 24 x 36 inches. This theme has been painted many times by Poussin, Tissot, and others. I don't think anyone has really shown the depth of the woman's feelings. This is another recognition story. 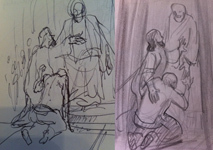 Two disciples walk from Jerusalem to Emmaus, conversing with a stranger. Only at the end of the journey do they realize He is their resurrected Savior. 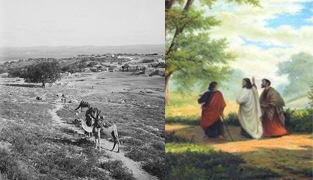 The picture on the left is a 19th century photo of the Palastinian village of Imwas, thought to be the ancient town of Emmaus. 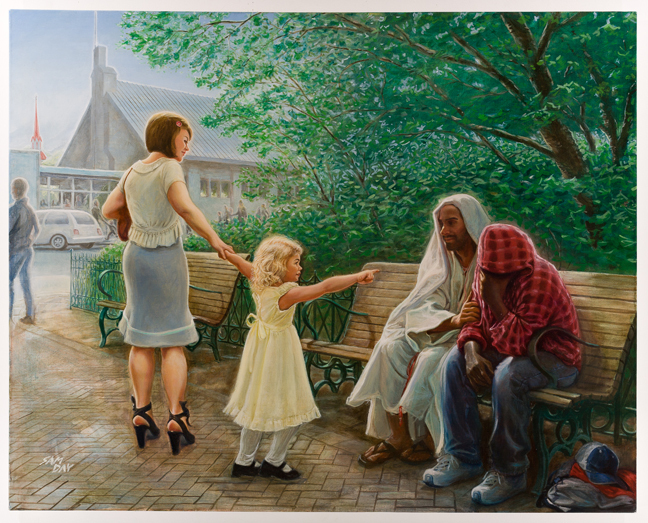 On the right is the story as depicted by the Swiss painter Robert Zünd. This is not a Biblical illustration, per se, but illustrates a Gospel theme. What is the balance between Law and Grace? Does God deliver swift retribution, or wait to see if we'll repent? When we are wronged, we want Justice. When we do wrong, we want Mercy. 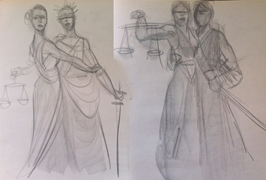 Using the Classical (Greek) depiction of Justice, I here embody her sister Mercy, holding back her strong arm. Another crucifixion painting. This is the place, but the scene will be darker. 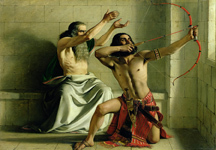 This is William Dyce's depiction of Joash shooting the Arrow of Deliverance. But in 2 Kings 13:16-17 we read that Elisha put his hands on the king's hands. 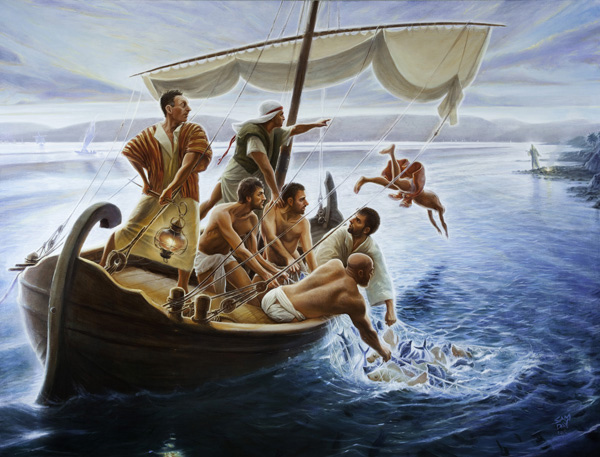 I want to paint this scene showing that the king's strength, Israel's strength, is not from the youth and stature of the man, but by the power of God, through His prophet. This concept is not fully developed, but the idea is the Bar of Judgement, at which Christ is our advocate before the Father.